SIX14 Productions Inc. is a certified provider of deposition and legal video services to the southern California legal community. 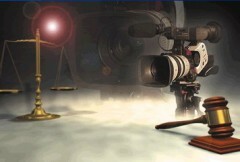 SIX14 Production’s legal video specialists provide only the highest quality legal video products and services. Our legal videographers use only high-tech equipment to record all video depositions. Depositions and legal proceedings are digitally recorded. These digital recordings can be delivered as DVDs or converted legal industry standard MPEG1 or any other digital format (see Encoding below). Videotaping depositions digitally gives you the ability to utilize state-of-the-art synchronization of video-to-text which can then be incorporated for use in sophisticated trial presentations. Our synchronization service works with the leading legal industry software like TrialDirector, Sanction, Summation, LiveNote and Trial Max. We provide a free Synchronizer application for playback and trial preparation if you don’t already use a trial prep system. Virtually any type of file or media can be synced. We work on PCs and Macs. Our customers trust SIS14 Productions Inc. to deliver the ultimate combination of accuracy, ease of use and timely turnaround. Before a deposition can be used in most trial presentation software it needs to be in the correct digital format. SIX14 Productions Inc. can sync your depositions to just about any digital media. However, your playback software may not be as flexible — most trail presentation software will suggest video be in MPEG-1 format. If you don’t know how to convert, or if you have a bigger stack of DVDs than you care to slog through for conversion to MPEG-1, we can help. Just ship us your source media, and we’ll take care of the rest. Within a few days we’ll ship back the finished work. SIX14 Productions Inc. uses professional encoding hardware and software to ensure your files are reliable and look as good as possible. We have the experience to identify and work around many potential issues with source media. We can convert from a wide variety of sources to a format that will ‘play-nice’ with your presentation software.